We all knew Jeremy Corbyn would lead on the Windrush crisis that has seen people who arrived in the UK as children wrongly threatened with deportation at Prime Minister’s Questions today. Everyone expected the Labour leader to land stunning blows after a terrible week for the Tories – but the Prime Minister had tricks up her sleeve. May kicked off with an apology. “These people are British, they are part of us,” she said, before recognising the “confusion” and “anxiety” experienced by those who been treated poorly by the Home Office. Corbyn pointed out that it was back in March that he raised the case of Albert Thompson, a 63-year-old man who was denied access to the NHS for cancer treatment. He accused the Prime Minister of having “brushed it off”. May had her answer ready and confirmed that Thompson will be receiving the treatment needed. But Guardian reporter Amelia Gentleman soon tweeted that Thompson had not been informed of this development. Thankfully, someone informed Corbyn and he was able to put this to the PM later in the session. The Labour leader then raised the revelation that in 2010 the Home Office destroyed thousands of landing card slips – key to resolving tricky immigration cases, including the problems faced by the Windrush generation now. At that time, Theresa May was Home Secretary. Corbyn asked: did the Prime Minister, the then Home Secretary, sign off that decision? May again had an answer ready: “No. The decision was taken in 2009 under a Labour government.” The Tories roared with laughter and cheers – completely inappropriate in the circumstances – as it appeared the Labour leader had been wrong-footed. It seemed Corbyn was not prepared for this response, so he persisted with his line of questioning. Why is the PM blaming officials rather than Tory ministers? Is it Theresa May or Amber Rudd who is most responsible for the devastating landing cards decision? “Keep going Jeremy,” supportive Labour MPs urged. When Corbyn highlighted the contributions of the Windrush generation, those who came to the UK “to rebuild our nation” after the war, May agreed with his statements. She compared them to illegal immigrants and took the opportunity to happily indulge in her trademark: pushing the ‘good/bad immigrant’ dichotomy. “Isn’t it the truth,” asked the Labour leader, “that the Home Office became heartless and hopeless and doesn’t she run a government that is now callous and incompetent?” Finally, the Prime Minister saved what she thought was a winning point: “I will not take an accusation of ‘callous’ from a man who allows antisemitism to run rife in his party”. This isn’t the successful PMQs the Tories think it was. There is still doubt over whether the decision to destroy landing cards was in fact taken under a Labour government in 2009, as the PM claimed, and her cynical use of Labour antisemitism is both unhelpful to the MPs and members who have experienced racism in the opposition party and unhelpful to the Windrush generation, who will find no comfort in her sardonic put-downs. 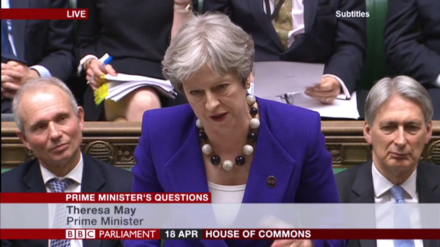 Update at 3.30pm: Theresa May has been accused of misleading parliament as it emerges no Labour minister was involved in the decision to destroy landing cards in 2009.